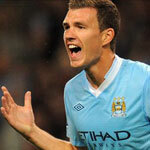 Edin Dzeko has no plans to quit Manchester City. Despite boasting an impressive goal return since moving to the Etihad Stadium in January 2011, the Bosnian international has struggled to hold down a regular start under Roberto Mancini. And with Sergio Aguero, Mario Balotelli and Carlos Tevez also vying for a shirt, it is difficult to imagine this changing anytime soon. This has led to Dzeko being linked with a transfer away from the Premier League champions, and there would likely be plenty of takers. However, the former Wolfsburg striker has ruled out leaving City, insisting he is happy to fight for his place in the side. "Every time I see a paper, for what seems like a year or more there is a story saying that I am leaving City, or that I want to go," the 26-year-old told The Sun. "But I've never said that so the stories don't come from me. I've always wanted to stay at City and fight for my place. "My motto has always been 'Never give up'. There is myself and three fantastic strikers so obviously we can't all play at the same time. So sometimes it can be difficult to find your rhythm. You could play one game and then be on the bench for the next three. “The more games you play, the more goals you are likely to score. But, as I say, with many good strikers at the club that's how it's going to be. As a player you accept that and just try your best each time you play. That's what I do and will continue to do."